Love the invigorating feeling you get after an hour and half long yoga session, but have trouble fitting your favorite Vinyasa Flow class into your hectic schedule? You need a quick way to jumpstart your day with a dose of yoga. That’s why you’re reading this article, right? You want to wake up, stretch out, have your breakfast and start your day. So here is a 10-Minute Energizing Vinyasa Flow Yoga Sequence to get your body and mind refreshed so you can take on the day with pep in your step. Begin by coming down to your mat on all fours. Knees directly beneath hips, wrists directly beneath shoulders, and fingers spread wide with index fingers pointing straight ahead. Draw your belly in and lift your knees slightly off the ground. Keep a deep bend in your knees with your heels off the ground. Concentrate on lengthening your tailbone to the sky. Hold this gentle Downward Dog for 3-5 deep breaths, breathing in and out through your nose. Now, start to energize your body by gently flowing between Downward Dog and Plank. Begin by coming into full Downward Dog. Straighten your legs without locking your knees, energize your arms by pushing into your palms, and continue reaching your tailbone to the sky. Don't worry if your heels don't touch the ground — this comes with time. From your full Downward Dog, draw your belly in and take a deep inhale as you bring your body forward into a Plank position. In Plank, your shoulders should be directly over wrists, body in a long straight line, and heels directly over toes. From your Plank, keep your belly drawn in and slowly exhale as you push your body back to Downward Dog. Continue lengthening from your fingertips all the way out through your sits bones. Flow between poses by using an inhale to come forward to Plank and exhale to go back to Downward Dog. Flow from Downward Dog to Plank 3-5 times, as slowly or as quickly as you wish, and return back to Downward Dog. Exhale as you step your left foot forward between your hands, knee directly over ankle. 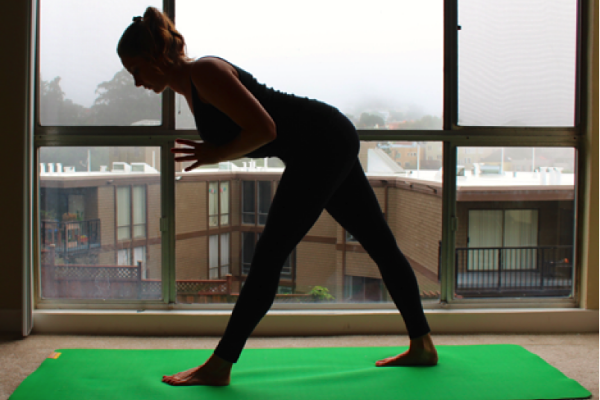 Your right knee can stay lifted or drop down to the mat, find your comfort level. Inhale as you draw your arms up beside your ears. Spread your fingers wide. Draw your belly in, tuck your tailbone, and lift your heart to the sky. Hold for 3-5 deep breaths. On your final exhale, bring your hands to the ground on either side of your left foot and step back to Downward Dog. 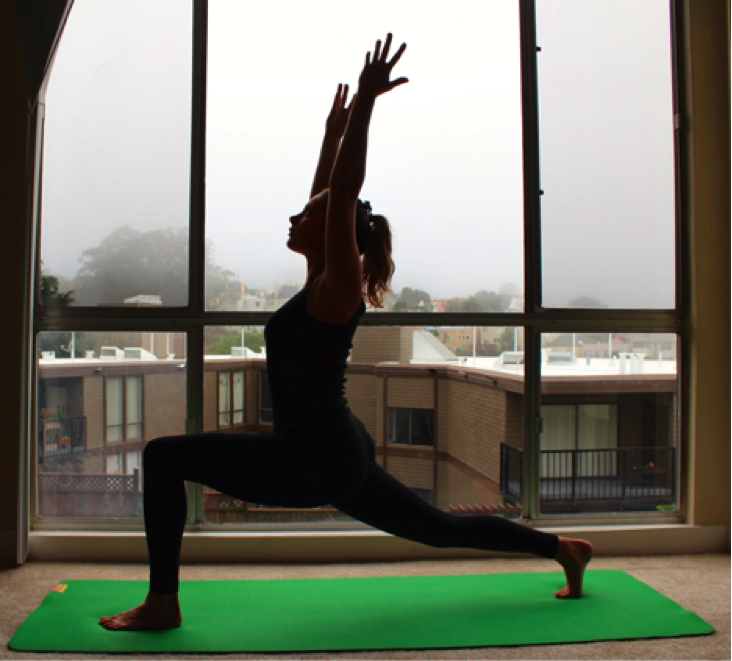 Repeat this lunge with your right foot forward, returning back to Downward Dog. Exhale as you step your left foot forward between your hands. Release your right heel to the ground so that your toes point to the upper right corner of your mat. Straighten your left leg without locking your knee. Hip bones should be pointing straight ahead, facing the top of your mat. Inhale as your draw your upper body half way up to a straight spine. Draw your hands together at your heart. Hold for 3-5 deep breaths. Focus on lengthening through the crown of your head while squeezing your inner thighs together. From Pyramid pose, place the weight of your body into your left foot, toes pointing straight ahead. 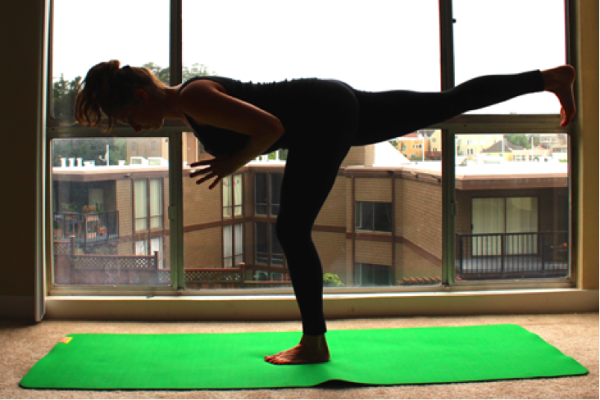 Inhale as you slowly lift your right leg until parallel with the ground, foot flexed with toes pointing to the floor. Draw your belly in and focus on making your body a straight line from your right heel to the top of your head. Take 3-5 breaths with your eyes focused on one point on the ground. With your final exhale gently lower your right foot to the ground beside your left foot. Take a moment to relax here in your Forward Fold. Neck relaxed, head hanging heavy towards the ground. Hold this Forward Fold for 3-5 deep breaths. Place your hands flat on the ground. As you exhale walk, step or jump your feet back to Plank. Shoulders should be directly above wrists, body in a straight line. Exhale, draw your belly in and push yourself to Downward Dog. Repeat this sequence with your right foot forward. Flow from Pyramid to Warrior III, then finding yourself again in a Forward Fold. In your Forward Fold, let your arms hang heavy and draw your belly in. Take a deep long inhale as you gently roll your body up to standing, focus on one vertebrae at a time. Exhale as you draw your hands together at your heart and close your eyes. Take 3-5 breaths in Tadasana as you focus on lengthening up through the top of your head. Use this time to clear your mind and set an intention for your day. Appreciate the time you’ve given yourself to nurture your body and mind. Focus on how you can harness this energy to create amazing opportunities for yourself today!